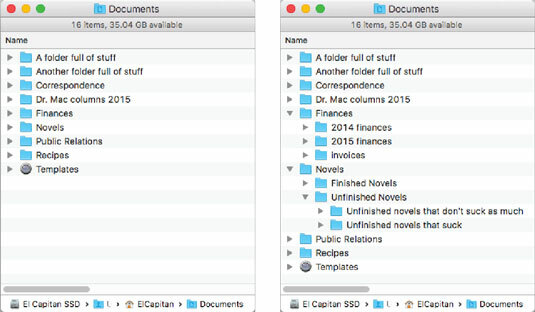 You can put folders inside other folders in OS X El Capitan to organize your icons. A folder nested inside another folder is a subfolder. When you notice your folders swelling and starting to get messy (that is, filling with tons of files), subdivide them again by using a combination of these methods that makes sense to you. Suppose that you start by subdividing your Documents folder into multiple subfolders. Later, when those folders begin to get full, you can subdivide them even further, as shown here. Before (left) and after (right) organizing the Novels and Finances folders with subfolders. Allow your folder structure to be organic, growing as you need it to grow. Let it happen. Don’t let any single folder get so full that it’s a hassle to deal with. Create new subfolders when things start to get crowded. If you want to monkey around with some subfolders, a good place to start is the Documents folder, which is inside your Home folder (that is, the Documents folder is a subfolder of your Home folder). If you create your own subfolders in the Documents folder, you can click that folder on the Dock to reveal them, as shown here. It’s super-convenient to have your Documents folder on the Dock. It’s even more convenient if you choose to view the Documents folder as a list.